I enjoy hobbies most don't. One of those hobbies is skydiving, but in 2009 I had a skydiving accident. My main parachute didn't open, but I managed to pull my reserve seconds before hitting the ground. I broke both legs and couldn't walk without assistance for eight months. I went to work with casts, crutches, ankle braces, and more. That was my "second chance" in life. Instead of just being another couch potato, I wanted to do something different, something extreme. I had a lot of time to myself during my recent deployment (March 2013-March 2014) to think and reflect upon my life. 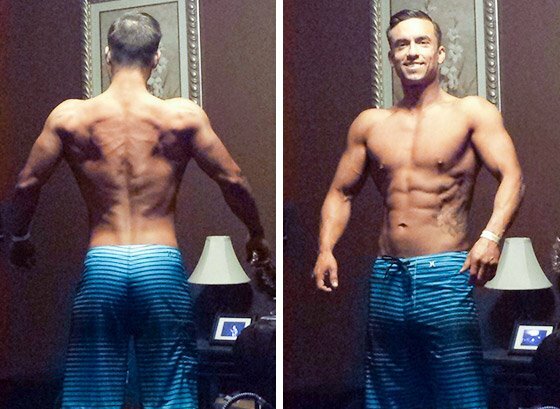 I contacted a good friend of mine, Joe Davis, who was also an NPC Physique competitor. I told Joe I'd lost motivation in the gym because I wasn't seeing results no matter how hard I worked for it. I asked Joe for workout and diet advice, and boy, did he deliver! He convinced me to compete in the NPC Patriots Challenge on July 5, 2014. It was perfect; it gave me a deadline and a goal. Every time I was in the gym or thought about eating a "bad meal," I remembered why I was doing it and re-focused. My friends, family and co-workers all told me things like: "You're obsessed," "I don't really see the point. You're not getting great results." "Why are you always eating?" "You need to eat this or that to get ripped, you're doing it wrong," and "What's the point?" There was friction. Why I was doing this? What happens when it's over? I never posted a single update to my transformation or showed anyone my progress photos until 14 weeks passed. The responses and positive feedback was absolutely phenomenal. Never had I felt better. I received text messages, emails, and Facebook messages, filled with questions like, "What's your cardio routine?" "What are you taking?" "What kinda of workout split are you on?" and "What's your secret?" I looked to science for my transformation and used solid numbers to accomplish my goals. I wake up every day and smile when I see my 6-pack in the mirror. I surpassed my goals and I have the results to remind myself daily to keep pushing forward. A majority of my training was spent during odd hours between 2 a.m.-4 a.m. Every time I felt fatigued or felt like quitting I would push harder and tell myself to push. I would close my eyes, sing along to my music, and "remove myself" from where I was. I would imagine myself on a tropical beach listening to music. I imagined the sun on my face, the cool ocean breeze, and the smell of salt in the air. I've never meditated, but this to me was my form of meditating, focusing my inner Chi. My energy came from sheer willpower. Get your head right and the body will respond to your mind's every command. I also stuck to the basics and had protein shakes, multivitamins, and caffeine with my workouts. My general rule was to eat 30 grams of protein at each meal, plus carbs as needed. The more green leafy vegetables, the better. Cooked into tuna helper packet. "Once I found my focus, I was able to push myself beyond what I perceived as a limitation." Time management. With my work schedule, my weekends change literally every week. Circadian rhythms are constantly out of whack so finding the correct time to eat, exercise, and sleep was a constant battle. Here in Vegas temperatures reach well over 110 Fahrenheit daily in the summer. Needless to say, sleeping in the middle of the day is miserable. It's beyond hot and you simply can't sleep unless you cool yourself down. I ended up getting a little swamp cooler from Home Depot and made sure that bad boy was blowing directly on me. This allowed me to sleep. The diet portion was hard at first, but if you prepare your foods you're setting yourself up for success. The lack of energy on a low/no carb day was hard. Once I found my focus, I was able to push myself beyond what I perceived as a limitation. I have truly learned what "muscle-mind connection" means. Also, using shirataki noodles in place of pasta is amazing! I felt full and felt like I was eating noodles. With only 2 net carbs, who wouldn't use them? Sugar-free popsicles were a treat to myself as well. I just entered my first competition July 5th here in Las Vegas at the NPC Patriots Challenge. It was an experience, that's for sure. But I don't think it's the next chapter in my life. Rather than focus on myself, it's time to focus on others. Most people are too afraid to ask for help. Every time you go to the gym you're always checking out someone else's form and exercise routine. It's human nature to want to learn more, to be better, but most people are too afraid to ask for the help and guidance you may possess. Since I revealed my transformation to my friends and family, I have written several workout regimens and nutritional plans specific to them with great results! I plan on continuing this process as I would love to see how others can transform themselves. Never quit. You're going to feel like you can't go on. Every part of your body will ache and the only thing that will keep you moving forward will be your attitude. If you want it bad enough, you'll figure it out. "Those who are currently transforming themselves, I've been there. You'll feel like you're just spinning your wheels, but you're not. You're not in this alone." Those who are currently transforming themselves, I've been there. You'll feel like you're just spinning your wheels, but you're not. You're not in this alone. No matter how much negative feedback you receive you can do this. Use that negativity to your advantage and use it to push yourself further than you thought possible. Keeping a strict workout routine and diet plan will not work. Making it part of your lifestyle will allow you to succeed. At Bodybuilding.com I was constantly reviewing different meal preparation techniques and different exercise routines, as well as nutritional advice (specifically Build muscle and lose fat by Kelly Baggett). That article really helped me get my diet on-point and allowed me to expand my meal choices. I wasn't limiting myself to only a certain type of protein. Rather I could eat the things I wanted as long as I didn't go over or under my macros for the meal.